That doesn’t sound so bad. That’s more than half! Or is it? That all depends on what you consider 0% to be. 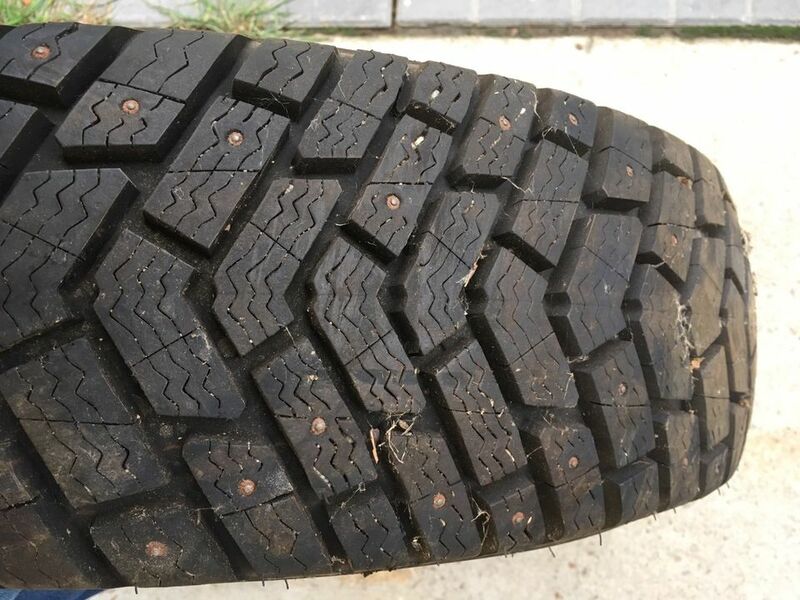 Many sellers appear to consider completely bald tread to be 0%. Therefore, a tire that had 10/32″ tread new would have 60% of its tread left according to that scale. But a tire is actually well beyond worn out when the tread is bald. No tire with below 4/32″ tread depth is even worth the cost of mounting, so consider that the 0% mark. Therefore, that tire with 6/32″ tread actually has 33% tread remaining. But only if it’s a shallow depth all-season tire. Winter tires typically have 12/32″ to 13/32″ of tread depth when new, and winter or all-terrain truck tires can have 16/32″ or more. So a winter tire advertised as having 60% tread depth at 6/32″ actually only has 25% of the usable tread depth remaining. Doesn’t look too bad, huh? It’s deceiving, because it would be good if it were the tread on a boot. It’s certainly plenty of tread for my summer use, and the wide lateral grooves mean that it will provide better snow traction than many brand new all-season tires. But if you care about winter traction, this is a tire that should be retired from winter duty. Any claims about the period of usage should be taken with a grain of salt. I’ve seen countless ads claiming very short usage periods of less than a season when it is visually obvious just from the pictures that the tires have at least 30,000 km on them. The average time of use is probably somewhere in the area in the area of two to four times what the seller claims on a typical Kijiji ad, but there occasionally are honest sellers out there too. So measure the tires for yourself before buying rather than making any assumptions as to the honesty of the seller. A tire that is used on a well-aligned vehicle and not subject to abusive behavior such as tire spinning or extreme cornering will typically wear at a rate of about 1/32″ per 10,000 km, though this rate can be double with softer tires near the beginning of their life. Using a tread depth gauge. A tread depth gauge is a simple, inexpensive tool that will quickly tell you how much tread is remaining on a tire. They can usually be purchased for well under $10 anywhere that automotive parts, supplies, or tools are sold. Before using the gauge, familiarize yourself with the scales. There will often be two different ones: one in millimeters, and one in thirty-seconds of an inch. The latter is the more common scale for describing tread depth in North America. A millimeter is about 25% larger than a thirty-second of an inch, so if you look at one scale while thinking in the other, your measurement will be off by that amount. Once you understand your gauge, you must figure out where to use it. On most all-season tires, there will be three or four straight, circumferential grooves running around the length of the tread. This is where you will measure the depth. Lateral or diagonal grooves between tread blocks will often be shallower depth than those. But with many tires, particularly winter tires, there may not even be circumferential grooves. To be certain that the grooves you are measuring are the proper ones, look for the wear bars. The wear bars will always be found in the deepest grooves. However, rather than averaging the values to determine the remaining life of a used tire purchase, go with the minimum. Any variance is the result of improper inflation or wheel alignment issues, and the section of the tread with the most wear will be the one that determines when a tire is used up. Once a tire is worn unevenly, you will not be able to get the tire back to even wear. Why is tread depth so valuable? The importance of tread depth in loose snow should be obvious. The deeper the tread, the more able the tire is to dig through the snow. But it is also valuable on hard-packed snow and ice, because the depth of the siping allows the tire surface to flex and grip those surfaces. 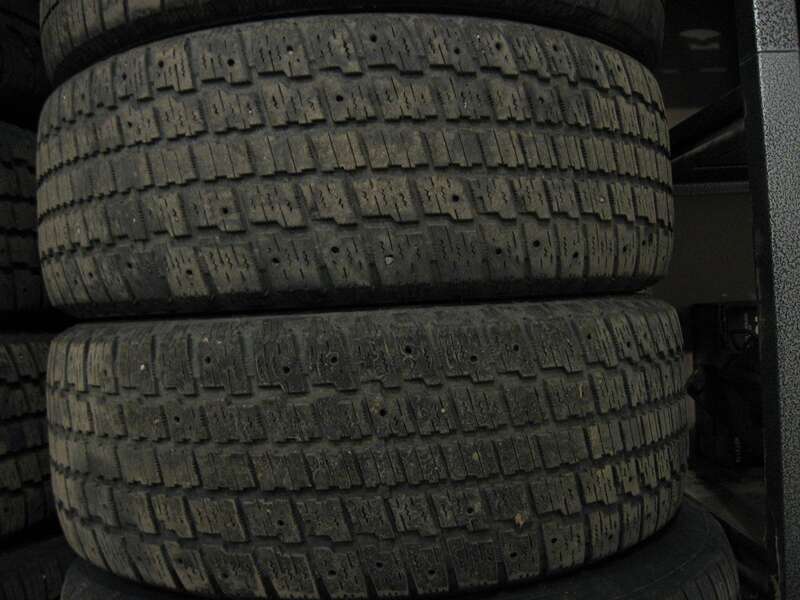 The depth of siping is typically only half of the full tread depth, so once the tire is about half-worn at around 8/32″ of tread, it has essentially become an all-season tire with no winter siping. 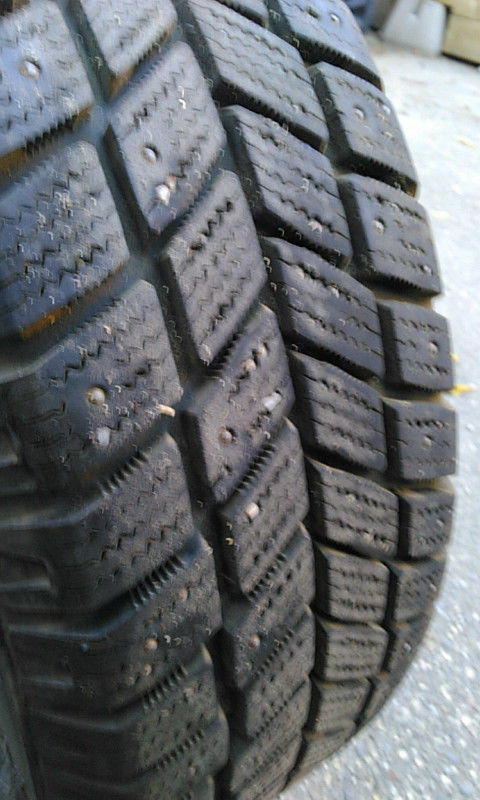 For studded tires, this is also the tread depth at which the studs begin losing effectiveness. By the time the tire is at 4/32″ tread depth, winter performance is massively compromised. The NAF noted an increase in braking distance on ice of 70% – from about 55 m to about 94 m – when comparing a new winter tire to one at 4/32″ tread depth during the 2010 Winter Tire Test. And it’s not just winter performance that is affected. Tires rely on their tread depth to be able to clear water in wet conditions. Without adequate tread depth, the tire will begin to hydroplane. That is, it lifts above the road surface and rides on the water instead of the pavement. The results of this can be disastrous if the tire completely loses contact with the road, but performance can be compromised even before that happens. There is no consistent tread depth at which hydroplaning will occur. It will depend on the water depth, the tread design, inflation pressure, and vehicle speed. The more tread you have, the less it will affect your grip. Tire Rack tested braking performance in heavy wet conditions, comparing new tires with 10/32″ of tread to used tires with 4/32″ and 2/32″, on both a truck and car. The car was able to stop from 70 mph in 195 feet on new tires. 4/32″ tread tires increased that stopping distance by 95 feet, to 290 feet, while 2/32″ tread tires took a 378 feet to stop; almost double. The truck results were even more dramatic, requiring 255 feet to stop on new tires, 377 feet to stop on 4/32″ tread tires, and a whopping 499 feet on tires at the legal minimum of 2/32″. At the point where the truck on new tires had come to a stop, it was still traveling 76 km/hr. If you had a braking situation in those conditions where you needed to stop and could barely do so with new tires, you would hit the object at 76 km/hr on those worn-out tires. 2/32″ may be the legal minimum tread depth, but for driving on anything beyond clean, dry roads, 4/32″ should be considered the minimum. Wet traction is compromised enough already by that point. Even on dry roads, the rubber will harden through the constant heat-cycling of driving and grip will decrease over time. Don’t even think of getting through a winter on tires at 4/32″. Estimating the value of used tires. We’ve established that the minimum tread depth worth even using in summer is 4/32″. It’s debatable whether a tire this worn is even worth the $60 to $120 it would cost to install them on wheels. So that’s a good place to set the 0% mark. The value of a brand new tire can be easily determined through tire shops or online retailers. But what would that same brand new tire be worth if purchased from someone other than an authorized retailer? Certainly not as much as from the retailer, as nobody has any obligation to warranty any defective tires or resolve any future issues you might have. If you can trust the second-hand seller, the most that the tires might be worth is the lowest price you can buy a comparable set for, before any taxes, fees, or mounting costs. If you can save the taxes and fees, maybe that would be worth the risks. So we have ballpark values for new or nearly worn out tires. What about those in-between? If a tire has 12/32″ of tread new, and 4/32″ tread when it’s worthless, that leaves a range of 8/32″ for which the value will be variable. The midpoint is 8/32″. Does that mean it’s worth 50% of new at that point? Nope. Not even close. If you can get a set of new tires for $600, and it costs $100 to mount and balance them, then the total is $700. If you buy a set at 8/32″ for $300, you still have to pay $100 to mount and balance them, for a total of $400. You will have then paid 57% of the cost of new tires for the last 50% of tread life, for tires that have less grip, less hydroplane resistance, and less winter capability. That doesn’t make sense. Subtract 4/32″ from the new tread depth of the tire to determine total usable tread. For a 12/32″ tire, this is 8/32″. Subtract 4/32″ from the current tread depth of the used tire to determine total usable tread remaining. For a 8/32″ tire, this is 4/32″. Divide the usable tread remaining by the usable tread of the new tire. So 4/8 for this example, equal to 1/2 or 50%. Square the result to account for the exponential decrease in value of a used tire, to get the percentage value. So (1/2)^2, giving us 1/4 or 25%. Multiply the percentage value by the cost of buying that tire new, before all taxes and fees. So a $600 set of 12/32″ tires could be worth as much as $150 at 8/32″ if they’re in good condition, with even wear and no visible rubber deterioration. Determine your own new reference value. When calculating the value of the used tires, it would seem to make sense to refer to the cost of those specific tires. But look beyond that, and instead find the cost and new tread depth of the tires that are the best value to you; the ones that you would buy if you were buying new. If the tires you would want to purchase new cost less than the new value of the used ones being sold, there’s no point in considering the value of tires you wouldn’t buy. They might be overpriced, and you’ll end up paying too much for the used tires based on a perceived new value that is too high. The most common example of this are original equipment tire lines. While these tires that are factory fitted on new vehicles are nothing special, and typically compromise grip, tread depth, and tread life in order to enhance government fuel economy test results, they are often priced very high because they are purchased either as single replacements for a damaged tire on a newer vehicle, or by a captive audience who believe that the tire the manufacturer chose was the best option of all, rather than the lowest bidder that met some basic specifications. Don’t forget about production date. While tire rubber will deteriorate very little if it is stored in a cool, dark place away from UV rays, it will deteriorate rapidly sitting motionless in the sun. Check the date and feel the hardness of the rubber. Look for clues from the seller about how the tires might have been stored or used. Even if you do your homework as to the tire value and tread depth, the tire rubber might still be rendered hard and worthless because it was stored in direct sunlight during summers. Examine the sidewall of every tire for evidence of rubber cracking or underinflation. Check each tread for unusual wear patterns. Check inside the tire to see if any plugs or patches have been installed. Here are a few examples I got from just a quick glance at two pages of Kijiji ads. 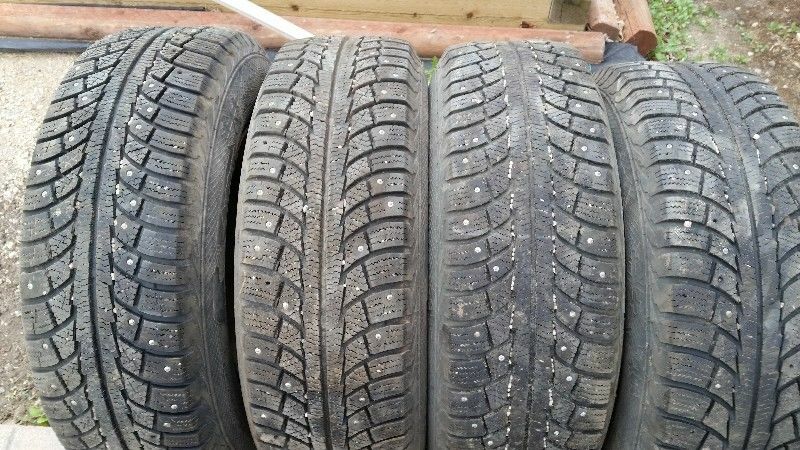 It is especially easy to estimate the previous usage of studded tires due to stud condition, but these lies and misrepresentations can be found with all types of tires. It’s just less obvious at a glance with other tire types. I can see eleven studs missing just by looking at about 25% of the tire tread in this grainy photo. So probably at least ten each. How is that “like new”. Do people typically buy new tires with the studs already missing? Once the tread is worn enough that the studs begin failing, the rest will fail in rapid succession. These Gislaved Nord Frost 5 tires are already two generations old, so at least six years. They are nowhere near “like new”. They have a season or two of tolerable winter performance left, at most. While the tread appears to be in like new condition, this tire has certainly been used. Studs simply do not look anything like that when they are freshly installed. You have to drive on them to wear away the squareness of the metal stud base. You can’t trust someone who is willing to lie about that. He’s probably also had them sitting in the sun for a few summers but will tell you they’ve been in the basement if you ask.
. . . and apparently another 48 months on gravel roads. The studs are clearly very worn. The heavy wear to the stud base that results in them appearing to be rounded and loosely fitted in the holes is probably the result of either changing the rotating direction of the tires a few times during the many times they’ve been removed and installed over the years, extensive gravel road use, or frequent and excessive wheel spin.